Day two of the Charlotte Dujardin master class showcased stunning horses, top Canadian talent and valuable lessons. 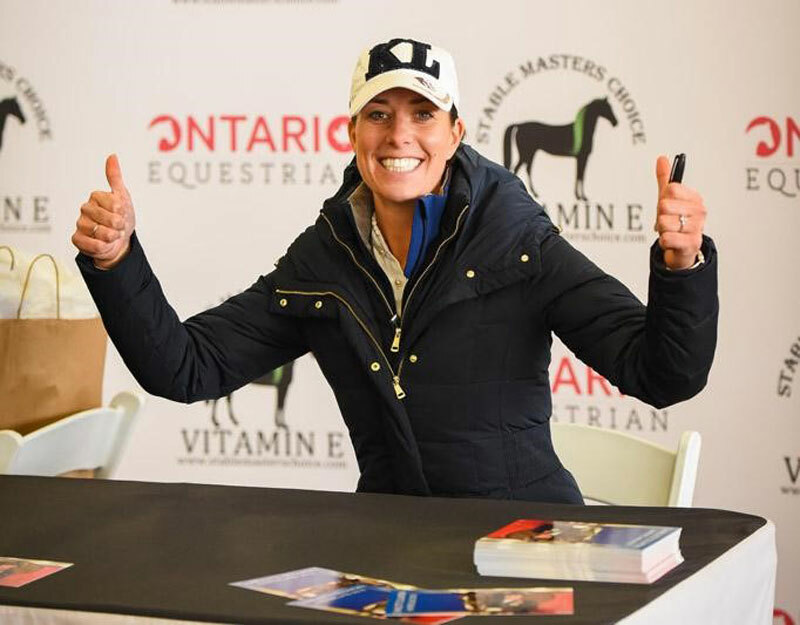 A weekend jam-packed with stunning horses, top Canadian talent and words of wisdom from one of the world’s best dressage trainers and riders concluded today, as a two-day master class with Olympic gold medallist Charlotte Dujardin wrapped up at Caledon Equestrian Park. The day began with a pair of lovely young horses demonstrating the early stages of training. Magda Moyseowicz, the only amateur rider of the weekend, rode her 4-year-old gelding Sam I Am while Alexandra Reid piloted 5-year-old Jewel’s Iodkarde. Dujardin emphasized the importance of developing self carriage and acceptance of the contact with both horses, even at this young age. She encouraged frequent stretching breaks to allow young horses to relax their muscles after the more difficult work. Next in the ring was Jaimey Irwin riding Fortissimo. The original plan was to showcase some of the First Level work, but with Fortissimo clearly overwhelmed by the intimidating atmosphere and the proximity of the audience, Jaimey instead demonstrated the importance of patience and building confidence in young horses by tactfully riding through tense moments and rewarding moments of relaxation. Janine Little and Billionaire were next up in the ring, representing Third Level. In sharp contrast to the younger horses, Billionaire was a bit too complacent for Dujardin’s liking, despite the large crows. As Dujardin introduced the audience to the more advanced dressage work such as shoulder in, travers, half pass and flying changes, she pushed Janine to always take risks and ask the horse for more energy, activity and expression. The afternoon session began with Tom Dvorak and Cyrus, a very experienced pair who demonstrated the Prix St-Georges work with ease. Dujardin put them through some of the more difficult combinations of the Intermediate 1 test, including how she likes to teach the zig zag, tempi changes and pirouettes. The final rider of the day was Evi Strasser aboard Disney Tyme, a 10-year-old gelding who made his Grand Prix debut this year. The knowledgeable audience appreciated the difficulty of the work at this level as Evi worked with Dujardin to perfect the full pirouettes, steep half passes and transitions from piaffe to passage which are a hallmark of the Grand Prix tests. The VIP audience had ringside seating. Charlotte signed many, many autographs for fans.